Beauty News NYC became famous as the first online beauty magazine of the world. It was founded by designer Kimberly McDonald in the year 2003 and has witnessed a surge in readership every passing year ever since. Beauty News NYC offers its readers with the hottest and the latest information on things like fashion, entertainment, lifestyle and beauty in New York City and from all over the world. The magazine tries to uncover the most intriguing services, products and places for its readers and offers them with unbiased reviews for each subject that it reviews. Beauty News NYC is headed by Candice Sabatini and B. Kim Taylor since the year 2011 and it is known to be one of the most respected beauty publications in the world. Its readers include skin care enthusiasts, culture vultures, pet owners, beauty junkies, DIY enthusiasts, home décor lovers, spa hoppers and metro moms. Some of the most popular sections of the magazine include Wines & Spirits, Dating, How To, Health & Fitness, Travel, City Pulse and Deal of the Day. Readers place a lot of trust in Beauty News NYC reviews because the magazine has become famous for staying unmoved to advertisers and sponsors. It believes in personally reviewing each product that it talks about and offers its readers with the most genuine and unbiased reviews with regards to everything that is featured in the magazine. 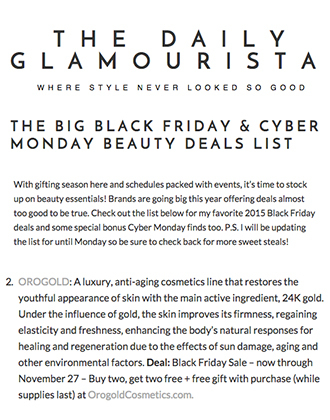 OROGOLD Cosmetics was obviously delighted to have the OROGOLD Manhattan Store featured in Beauty News NYC. 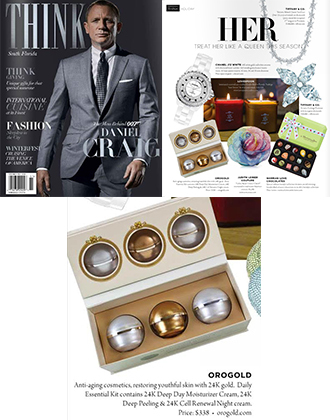 In an article titled Strike Gold in Manhattan, author Susan Romero talks about her experience at the OROGOLD Manhattan Store and a few ORO GOLD products that she sampled. 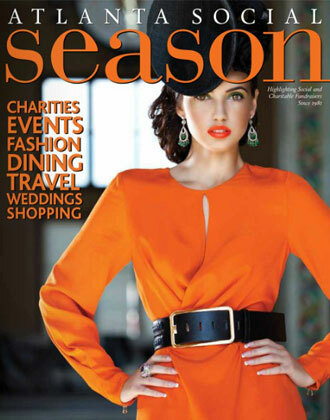 Susan Romero is famous for her love for all things to do with fashion and beauty. She attended the Columbia University Graduate School of Journalism and works as an employment law attorney who is also involved with freelance writing. Susan resides in Manhattan along with her teenage son. In her article, Susan terms OROGOLD as the hidden gem in Manhattan. She describes it as an anti-aging cosmetics store that offers customers with products that use 24K gold so as to rejuvenate the skin. Susan sampled some of our products and also checked out our luxurious VIP room while at the store. 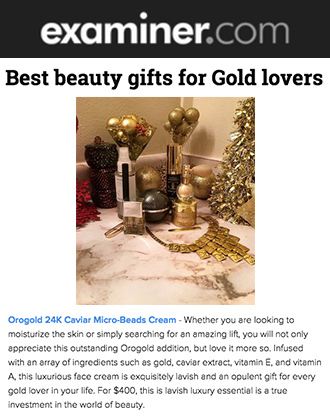 She mentions to her readers that one of the favorite OROGOLD products is the 24K Termica Energizing Mask, a self-heating mask that gives you a warming effect when it comes in contact with the skin. 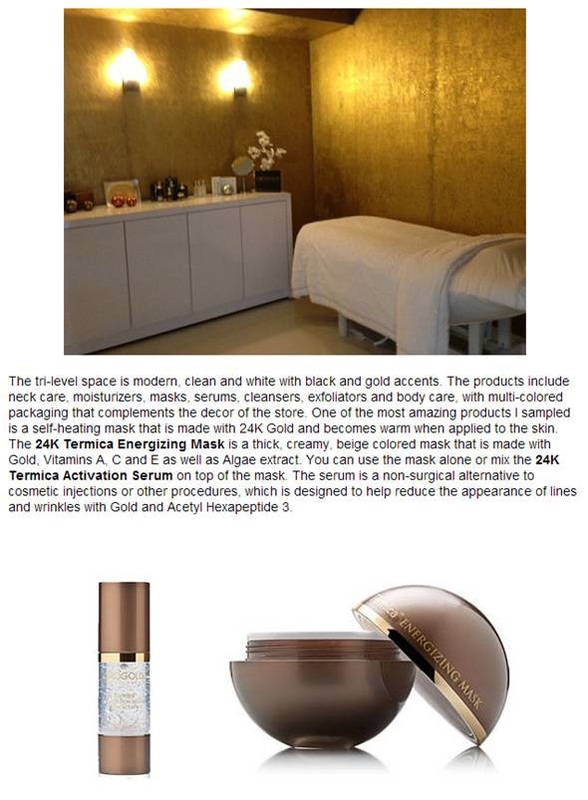 In her article, Susan also reviews the 24K Termica Activation Serum and mentions that it can be used as a stand alone product and also be used along with the mask. She reviews the 24K Termica Activation Serum as a non-surgical alternative to cosmetic injections, which is designed to help reduce the appearance of lines and wrinkles. OROGOLD is humbled by Susan’s review of our Manhattan Store and we hope to continue to serve our customers in the best possible manner at all OROGOLD locations. 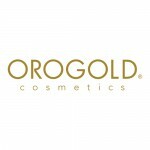 If you’re looking to sample a free VIP facial and check out OROGOLD products for yourself, all you need to do is walk into the nearest ORO GOLD store.